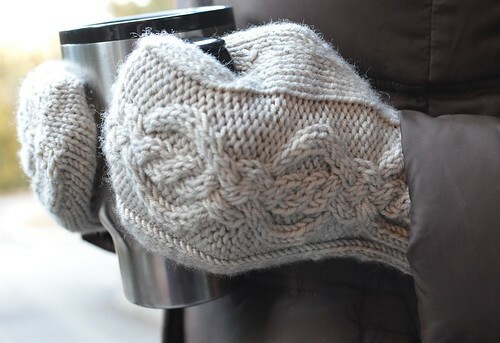 Some times, like right now around these parts, you also need a few quick and warm things, and that is where the Aberdeen Ave. mittens and hat patterns come in. I knew the Locke St. cardigan would be first up in February, and these likewise take their name from a Hamilton street name – Aberdeen Ave. and Locke St. intersect with each other, and with such Scottish place names to work with as inspiration, how could I resist working with cables? 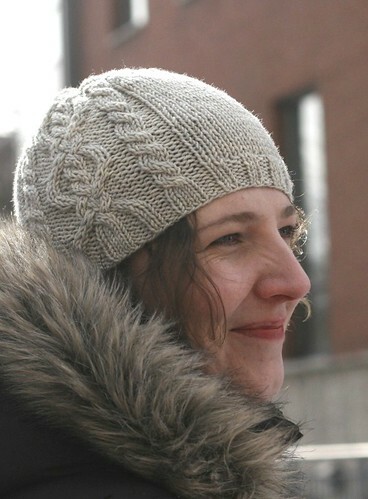 I loved the knotty twists and turns on these so much I couldn’t keep them to just one item, and just had to spread the cabled awesomeness to both a hat and a pair of mittens. In a collection of knitted items, it would be a crying, crying shame to overlook the winter accessories, don’t you think? And it’s especially pleasing to have a matching pair. There is something very satisfying about feeling put together like that when you leave your front door, even if it’s a blustery chilly day that makes you need to bundle up. I reached for the heavy worsted/Aran weight yarn for both of these, to help with both warmth and speed. A single skein of Tanis Fiber Arts Green Label Aran is all that’s needed for either the hat or the mittens, and either one would be great for that single skein of worsted or Aran yarn you’ve got hanging around waiting for a project! 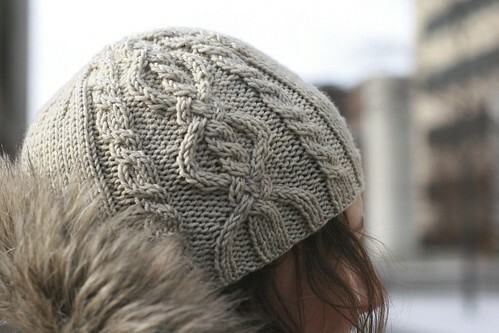 If you have more than a passing familiarity with a cable needle, you’ll have this hat finished in a snap. There’s just enough interest for you on the central cable panel running along one side to keep you from getting bored, and before you know it you’ll be decreasing and finishing up the top and reaching for another skein of yarn to make the mittens to match. If you’re still new to cables, these will be small canvases to practice on while you prep yourself for larger cabled projects. As with all items in the Urban Collection (currently available on Ravelry – will be made available on Patternfish as an e-book and individual patterns once the collection is complete), both the Mitts and the Hat are available to be purchased individually in my Ravelry store, or as part of the collection. Once you’ve purchased the collection, you’ll receive all patterns that are added to it with each update, until it is complete. I am grateful once again to my friends Austen (for modelling) and Jane (for photography), and to Jaya Purswani for the technical editing on these two projects. I hope you’ll enjoy them! Now that I’ve introduced you to all three February releases in the collection, I”ll be happy to report back on some other ongoing knits next time. I hate to jinx things, but I might just be getting close to finishing my Gwendolyn cardigan after all – and possibly even a pair of socks. Dare I say it, I may get some more warm knits finished in time to wear them in the chilly season after all. Screw the budget. I’m pre-ordering the collection. I really do love that knotted cable. Those are some fantastic (and cozy! )-looking mittens. This cable is beautiful. I really like the design and think the mittens are devine. By the way the colour of that wool is so sleek – great choice! 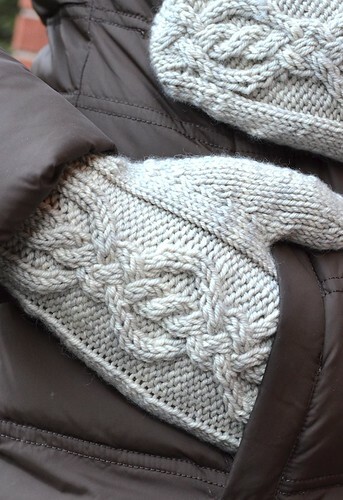 Nice set of hat and mittens, love the cables! I like the neutral hue you chose for these accessories; I think they would pair nicely with any coat, whether it were black, brown, blue, grey, or some brighter color. The cables are, as always, lovely. I continue to look forward to additions to the collection, and to posts about your knitting in progress. Winter knit accessories are a must! Lovely work-lady-ship! Absolutely beautiful collection so far! Can’t wait to see what’s next! I’d had a *meh* mitten pattern queued for a lovely skein of Quince Osprey I’d been given, but when I saw your Aberdeen, I knew that was the one. Thank you! ← Urban Collection: Locke St.